New Delhi, August 10: Rajya Sabha on Thursday unanimously passed the National Sports University Bill 2018 by the voice of vote. 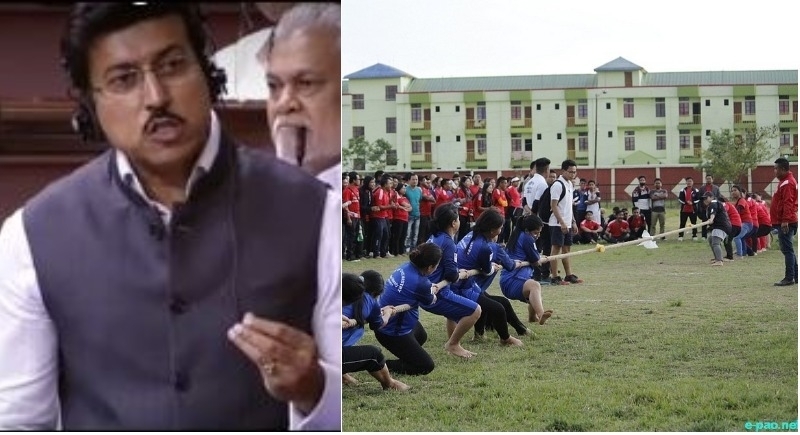 Notably, the bill seeks to establish a first-of-its-kind National Sports University in Manipur to promote sports education, research and coaching. This comes almost a week after Lok Sabha passed the bill. During the discussion, Sports Minister Rajyavardhan Rathore informed that the university will be set up at a cost of Rs 524 crore and the Chancellor of the University will be from the sports field as well as the university’s academic council will consist of sportspersons. He further added that it is a major step towards bringing to reality Prime Minister Narendra Modi’s vision of developing a world-class 360-degree sports ecosystem in India. The Minister also noted that the Government has focused on each and every need of a budding sportsperson and has enhanced the stipend as well as food and supplement allowance. He informed that Government is developing a Mobile App which will have information about sports academies and centres. He, in the end, said that it is everyone's responsibility to take sports forward, be it central government or private sector. “National sports development funding has helped so far and we won't let anyone go without funding,” the Sports Minister added. The bill replaces the National Sports University Ordinance, 2018 that was promulgated on May 31, 2018. The Bill seeks to establish a National Sports University in Manipur. Establishment of the University: The National Sports University will be headquartered in Manipur. It may establish outlying campuses (within or outside India), colleges, or regional centres. The University will: (i) undertake research on physical education, (ii) strengthen sports training programmes, and (iii) collaborate internationally in the field of physical education, among others. Functions of the University: Key powers and functions of the University include: (i) prescribing courses of study and conducting training programmes, (ii) granting degrees, diplomas, and certificates, (iii) providing facilities through a distance education system, and (iv) conferring autonomous status on a college or an institution. Authorities: The University will have the following authorities: (i) a Court, which will review the policies of the University and suggest measures for its development, (ii) an Executive Council, which will be the principal executive body, (iii) an Academic and Activity Council, which will supervise academic policies, (iv) a Board of Sports Studies, which will approve the subjects for research and recommend measures to improve standards of teaching, and (v) a Finance Committee, which will examine proposals related to creation of posts and recommend limits on the expenditure of the University. Further, additional authorities may be declared through statutes. Executive Council: The Executive Council will be responsible for all administrative affairs of the University. Members of the Council will be nominated by the central government and will hold office for two years. The members will include: (i) the Vice-Chancellor (appointed by the central government), (ii) the Joint Secretary, Ministry of Youth Affairs and Sports, and (iii) four persons from among eminent sports persons and distinguished coaches. Key functions of the Council include: (i) creating academic posts and their appointment, (ii) managing the revenue and property of the University, (iii) managing and regulating the finances of the University, and (iv) partnering with industry and non government agencies to advance knowledge. Statutes: The Schedule to the Bill contains statutes. These statutes specify the establishment, composition, and powers of various authorities such as the Chancellor, Vice Chancellor, and Dean of Schools. The Executive Council may make additional statutes, amend specified statutes, or repeal these statutes. Any such action will require the approval of the central government. Role of central government: The central government will review and inspect the functioning of the University. The Executive Council may take action based on the findings of the inspection. If no action is taken within a reasonable time period, the central government may issue binding directions to the Council. In addition, the central government may annul any proceeding of the University which do not conform with the Bill. Fund: The University will maintain a Fund. The following amounts will be credited to the Fund: (i) contributions by the central government, state governments, or the University Grants Commission, (ii) loans, gifts, and donations, (iii) income from fees, and (iv) amounts received from any other source. Funds will be invested based on the recommendations of the Finance Committee. Dispute and appeals: Any student or candidate whose name has been removed from the rolls of the University and who has been barred from appearing for examinations may appeal to the Executive Council for review of the decision. Any dispute arising out the disciplinary action taken by the University against a student may be referred to a Tribunal of Arbitration (at the request of the student). Disputes arising out of the contract between an employee and the University may also be referred to a Tribunal of Arbitration.